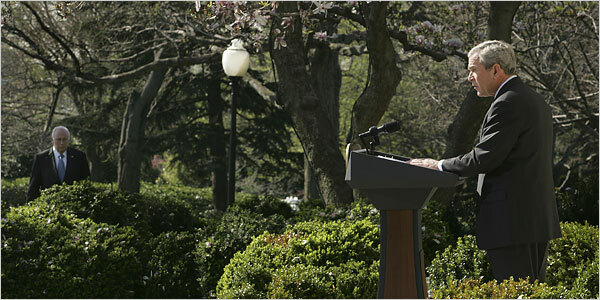 It looks like Cheney is keeping an eye on Bush during this press conference in the Rose Garden. At least they kept the bulge on Bush’s back hidden so nobody would suspect that Cheney was using to control what Bush is saying. You also recently announced that you were leaving the Republican Party and joining the Libertarian Party. What was your reason for doing that? Several-fold. One, that the Libertarian Party, among all of the parties out there, is the only one that is true to my core philosophy of working to minimize government power and maximize individual liberty. None of the other parties, and especially the Republican Party any longer, is at all committed to that philosophy. And secondly, my great concern, manifested especially since 9/11, is the assaults on our fundamental civil liberties by this administration. [That’s] personified, for example, in the disregard for the rule of law as exhibited by the warrantless NSA [National Security Agency] electronic surveillance in violation of the Foreign Intelligence Surveillance Act. More recently, [there were] documented abuses at the FBI in carrying out certain of the expanded powers granted in the Patriot Act, namely, national security letters. And in January of this year, the testimony by the attorney general that this administration does not believe that the fundamental right to a writ of habeas corpus is an important, fundamental, constitutional guarantee. So what we have is a party, the Republican Party, to which I was very proud to belong for many, many years, no longer being committed to a core conservative philosophy. The Libertarian Party is so committed, and I felt that at the time that it was necessary to make a change because of the seriousness of the assaults on our civil liberties. Speaking of that, Sen. Chuck Hagel [R-Neb.] recently speculated aloud about impeaching President Bush. Given your own experience, what do you think of impeachment when it comes to this president? Some of the issues that we’ve looked at, and that have come to the public’s attention in recent years, I think are extremely serious and ought to be inquired into by the Congress. On the issue of warrantless electronic surveillance, Congress still does not have a full and accurate view of what has gone on and what continues to go on with regard to what seems to me to be a clear violation of the terms of the Foreign Intelligence Surveillance Act by the administration. That’s just one small area that I think Congress definitely needs to look into. Where they take it from there depends on what they find out, but it’s certainly something that needs to be looked at. George Bush still does not get the fact that this is a democracy and that there are other co-equal branches of government. The Founding Fathers believed that major Presidential appointments should be done with the advice and consent of the Senate. The voters felt that the President was not exercising his responsibilities in a competent or honest manner and voted to place further checks on him by electing a Congress of the opposing party. The White House realized there were not enough votes to confirm Sam Fox as Ambassador to Belgium following Fox’s actions to undermine the democratic process in this country by contributing to the Swift Boat Liars, who were responsible for the most dishonest smear campaign in recent history. Also reacting with outrage, is Chris Dodd (D-CT), who was the first Senator to publicly state his strong opposition to the Fox nomination. The remainder of Bush’s term is going to see many political battles. Actions such as this on the part of George Bush act to demonstrate that any checks placed on the White House by the Democratic Congress are justified and necessary. Why are underdogs such fun? New Mexico Gov. Bill Richardson is having a great week, and it is far more entertaining than the exhausting Clinton/Obama rivalry marathon we will be subjected to all year. Not only did Richardson raise more money than his second-tier colleagues, Sens. Joseph Biden (D-Del.) and Chris Dodd (D-Conn.), but he got President Bush to bless his trip to North Korea, creating an opportunity to remind everyone again that he is the Foreign Policy Stud of the Democratic contest. Richardson will visit Pyongyang to collect the remains of American troops who died in the Korean War. He will be accompanied by former Secretary of Veterans Affairs Anthony J. Principi, but it is Richardson’s trip — after all, he is the one with an open invitiation to visit and confer with the North Korean government. He has earned his stripes not only as U.S. ambassador to the United Nations but has been nominated for the Nobel Peace Prize for negotiating the release of political prisoners in Iraq, Cuba and North Korea. Such coverage will do more to get Richardson a shot at the Vice Presidency than move him ahead of the front runners, but at least it helps keep his candidacy alive. This just might not be a good year to be a front runner. The old conventional wisdom was that Hillary was unbeatable. Now we have at least a two way race, with Obama raising $25 million, coming only about one million behind Clinton. Obama raised his money from 100,000 individuals, while Clinton received money from 50,000. This leaves Obama with many more people who have contributed less than the maximum and who might contribute more during the year. Obama has also raised $4.2 million more than Clinton on the internet.Edwards trails Clinton and Obama with raising $14 million, but he continues to be strong in Iowa and New Hampshire polls which could give him momentum leading into the multi-state primaries in February. Richardson’s $6 million keep him alive as an alternative to those dissatisfied with the front runners and at least keeps him in the lead among the second tier candidates. The Republican race is even more confusing. McCain lost his front runner status to Giuliani, but Romeny raised more than either, despite doing poorly in the polls. Republicans, who have lots of make believe ideas, seem to like the idea of yet another make believe actor President, with Fred Thompson appearing like he might jump to the head of the GOP pack if he were to enter the race. With Eric Dondero, Chairman (and I believe sole member) of Libertarians for Giuliani saying he will not return (in the comments to this post) I must turn to others for views on Giuliani. Steve Benen, Matthew Yglesias, and Glenn Greenwald offer far more informed views than Dondero. Steve Benen warns us to “be afraid” of Giuliani’s “authoritarianism” while Matthew Yglesias calls him “a power-hungry egomaniac.” Glenn Greenwald warns of Giuliani’s “compassionate authoritarian.” These views stemmed from two recent reports on Giuliani. In a brief press availability in front of his campaign bus, I asked Rudy whether he was saying Bush could veto the supplemental and, in the absence of a deal with Congress, fund the troops in Iraq under his own authority. “If he vetoes it, he’s going to have to find a way to support the troops,” Rudy said. “They have given him the authorization to fight the war,” and “Bush has the power to redirect the money and time to work something out” with Congress. The last bit suggests that maybe Rudy is thinking in terms of only the next few weeks and not making a broader claim about presidential authority (although he kept on saying “inherent authority” over and over). But it wasn’t quite clear what he meant, and his statements could be seized on by his critics to argue that he has a dangerously out-sized view of presidential powers. I’ll defer to the lawyers in here, but my understanding is that Rudy is wrong: the president can’t simply re-direct money Congress has appropriated for specific purposes. If Bush wanted to go down a very confrontational route, he could sign the supplemental and defy the timetable as unconstitutional, but he can’t simply pull money out of nownowhere or take it from elsewhere for his own preferred purposes. Malek’s political career spans over three decades. In 1972, after Watergate, he served as the deputy chairman of President Richard Nixon’s re-election campaign. Malek was director of the 1988 Republican National Convention and campaign manager for President George H.W. Bush in 1992. Under questioning by Sen. Carl Levin (D-Mich.) during the second day of hearings, Malek admitted that a memo written by him did suggest that people who were not Nixon’s supporters be punished in some way. “Unethical, immoral and improper” was the way Levin described Malek’s role, adding that Malek had “spearheaded a calculated, systematic effort to sell government favors to the highest bidder in the Nixon reelection campaign and to punish low bidders or the nonbidders.” Which may explain why Malek’s bid for the postal job died in committee. If only the responsiveness program had been his sole bad deed. The Post reported that in 1971 Malek had ordered the FBI to conduct an investigation of then-veteran CBS correspondent and Nixon critic Daniel Schorr. It was also in 1971, The Post reported, that Malek was given a patently anti-Semitic order from a paranoid Richard Nixon to count the Jews in high-ranking posts in the Bureau of Labor Statistics (BLS). Instead of refusing, Malek set about compiling a list of 13 of 35 top BLS employees who, he believed, were Jewish. Less than two months later, two senior BLS officials who were Jewish were moved out of their jobs to less visible posts. Malek acknowledges carrying out the disgusting hunt for Jews, but he denies having anything to do with the transfers. Disclosure of his role in counting Jews cost him his job as deputy chairman of the Republican National Committee in 1988, just as the responsiveness program had wrecked his postal nomination six years earlier. McCain is building quite a team. In addition to Malek, McCain hired Terry Nelson, who was responsible for the “bimbo” ad attacking Harold Ford in the recent Tennessee Senate race, to be campain manager. We should have known that McCain might associate with just about anyone after we saw how he hugged and kissed George Bush. Related Story: Kerry says that McCain approached him about running as VP, but this isn’t the first time this suspicion was raised. After about sixteen hours of being down, a database which crashed has been repaired and the blog is back up! If it took much longer I might have gone into serious blog withdrawal.